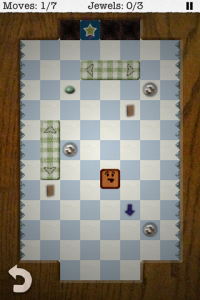 Woodhead is a challenging puzzle game created by Terrance Kritmen (writer & music) and myself (design & programming). It is available for iPhone/iPod Touch from the iTunes App Store ($1.99). The above picture shows one of the levels in the game. The gameplay goes: swipe to move, try to collect all the jewels and reach the exit within the given number of moves. Doesn’t sound too groundbreaking, does it? Well, here’s how I tried to shake that up a bit. One thing that (almost) always bothers me about touch screen games: onscreen controls, virtual buttons. So, with Woodhead the only on-screen buttons are the quick reset and the pause button. Movement is mapped to swipes, that’s an easy start to touch interaction. How else could I take advantage of the touch screen? To start with, if you look at the screenshot, there are three items that don’t look like jewels (when you see them in the game, they’re always moving). When Woodhead touches those items, the game pauses and allows you to touch the screen to place a tile onto the game board. This allows you, the player, to add items to the game board. Each different item lets you place a different type of tile: cardboard makes a solid block, arrows change Woodhead’s direction, green slime makes a larger goo spot that Woodhead sticks to instead of sliding past. You will need to plan ahead to future moves, trying to create the quickest path for you to reach the goals. How else does this game differentiate itself? Writing. 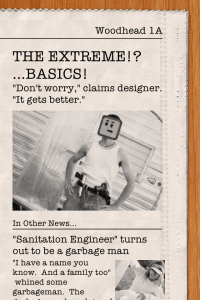 Which is pretty damn funny thanks to Terrance Kritmen. 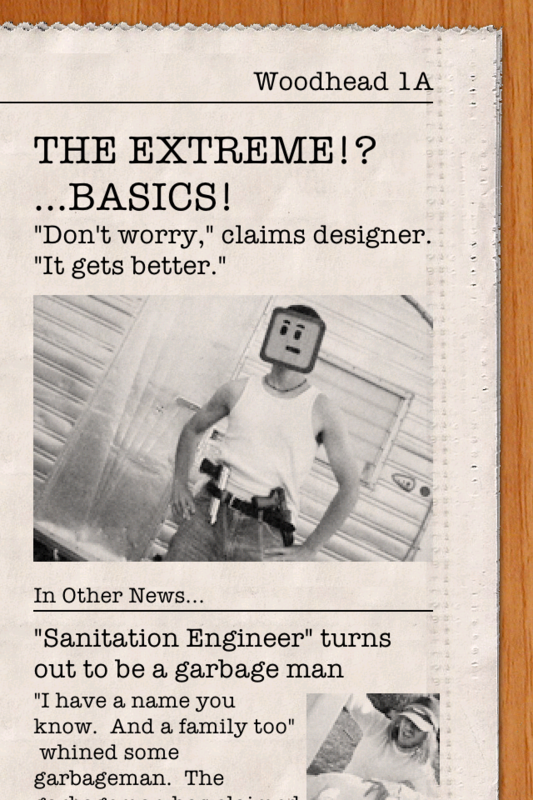 Each level starts with a newspaper page, giving the level name, (sometimes) a hint, and an “In Other News…” article. Woodhead, being the title character and a bit of a narcissist, is inserted into the photos. In between worlds (or Pages as I like to call them), Woodhead answers questions at press conferences, giving the game some story and humor. 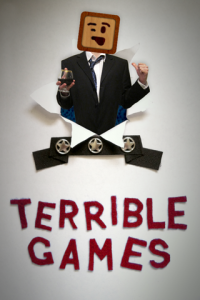 This entry was posted in Games and tagged game, iPad, iPhone, iPod, puzzle, Terrible by Matthew Klundt. Bookmark the permalink.